The French brand L'Occitane en Provence has been one of my favourite brands, especially for bath and body since they launched in South Africa nearly 5 years ago, but are you aware that they have some wonderful and very effective skin care products? My staple anti ageing day and night cream since its launch, has been the award winning Divine Cream! More about this product in a later post. 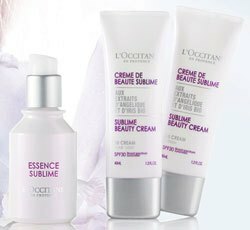 The one aspect that I like about L'Occitane, among many, is that they are constantly researching the effects and uses that plants can have on our skins. Their latest discovery has revealed that there are active ingredients in both the blue and white Iris flower, organically grown of course, that promotes skin desquamation and epidermal cell renewal, as well as the ability to visibly reduce redness and help prevent the appearance of blemishes. Combine the above with the following two ingredients, Organic Angelica essential oil that not only protects the skin against free radicals, but also improves elasticity and some Organic Angelica water will ensure the increase in the production of Aquaporins and you have an "Iris Angelica" marriage made in heaven. This marriage has given birth to the latest additions in their ever expanding SKINCARE family. The Sublime Essence and the Sublime BB Cream slots into the existing Angelica range. I was lucky enough to receive the essence and both of the BB creams, medium and light, to review. This is only my third BB cream that I have tried and reviewed and considering how many are out there, I am somewhat of a BB cream novice! I must explain that this has been through choice, as I have only wanted to try BB creams belonging to houses that have their roots in skincare rather than a background in make up, as the treatment element is important to me. It is hard to talk about the Sublime Beauty Cream without mentioning the Sublime Essence as this will boost the radiance enhancing effects of the cream. 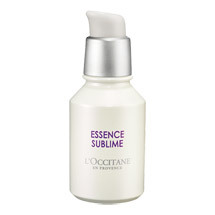 This light, sheer serum can be used daily by all skin types and acts like a second skin. It will tighten,moisturise and literally leave your skin velvety soft all of which I can agree with.The one huge bonus of this product, is that they achieve all this without using any silicone, as this is a silicone-free formula! The texture of the Essence is great, as it melts into the skin and has a wonderful fresh fragrance. It was enough moisture for me to not need to use any other moisturizer over the top,but I rather applied the Beauty Cream immediately. 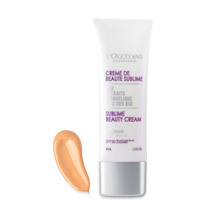 L'Occitane claim that the Beauty Cream will both enhance the complexion and ongoing will visibly reduce the appearance of blemishes. The skin will also look plumper and softer and it will provide a perfect flawless finish to the face and again I cannot dispute these claims! 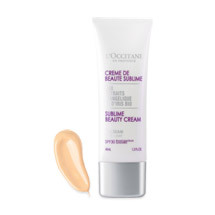 The one difference between this BB cream and the others that I have tried, is the matte powdery finish it leaves on the skin as opposed to a dewy look. This all depends on what your skin type is and which look you prefer, I actually liked both. The prices are on the high side, but considering I won't be buying a foundation or a sunscreen in the future, it all balances out! The Sublime Essence and the Sublime Beauty Cream really do complement each other and both were a refreshing joy to use, and they delivered on all of their promises, so well done to L'Occitane and may you continue to source the wonders of nature for us to enjoy! I'd like to know your thoughts on the serum. Is there a huge difference after a long time use? How long would the 30-ml bottle lasts? I'm using beauty flash balm and it acts like the serum. I want to try this since i really love l'occitane products! Hi, I have been using the serum everyday under the BB Cream and I am really enjoying this combo.I have been using Clarins Double Serum in the evening, as I have a mature skin,which needs more focused anti aging treatment.The beauty flash is one of my favourites also, but as it says, it is a "flash of beauty" and does not really have any cumulative effects.Depending on your age and skin type the Sublime Essence is definitely worth a try.My bottle is still going strong after daily use for over 2 months. Hope this helps! WAYS TO RECYCLE THAT OLD CASE!